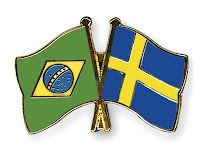 Today Sweden and Brazil will face off in a friendly match at Råsundastadion — Solna. Brazil will be coming from a recent Olympic shocker against Mexico who stunned with a 2-1 victory to secure a Gold medal. Sweden has only managed two victories against the South American greats in past 14 fixtures, and losing 9. None of the team has scored more than 1 goal in their last four meetings. A 1-1 draw at the 1994 World Cup is the last time a match between these two resulted in more than one goal. Brazil are returning to the stadium at which they won their first World Cup in 1958, the Rasunda. The Swede were thrashed 5-2 in the final.